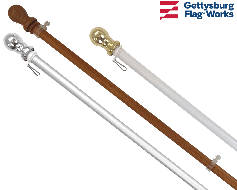 Beautiful, high-quality outdoor Maryland state flags for mounting on most flagpoles. Choose your size, mounting type and material. Made in the USA! 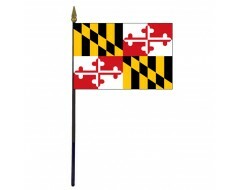 Outdoor Maryland state flags are available in a variety of size, material and mounting options. 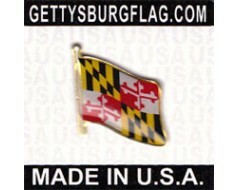 Nylon Maryland flags are lightweight but durable and dry quickly after a storm. For a more heavy-duty Maryland flag, choose the heavy-weight polyester flag. The heavy duty polyester requires more wind to fly, but also lasts longer. Please call us if you don't see the size or style Maryland flag that you are looking for. We can find, or custom make the perfect flag for your display. Maryland state flags are divided into four quarters. The canton and lower fly quarters feature a black and gold design that comes from the personal coat of arms of George Calvert, while the other quarters feature the red and white trefoil cross of the Crossland coat of arms. Both of the patterns were included in the flag honor the founder of colonial Maryland, Cecilius Calvert. 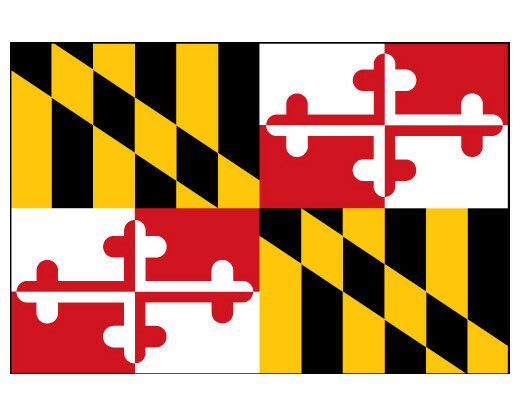 Their use emphasizes the unique aspects of Maryland's heritage, in contrast to the flags of many other states which include national symbols alongside state symbols. Maryland was founded by Cecilius Calvert, and his personal coat of arms provided Maryland with its first symbol. The black and gold coat of arms of the Calvert family were used until the Civil War, at which point they became associated with Marylanders who supported the Union. Many Marylanders sympathized with the Confederacy, and they began to represent themselves with the red and white trefoil of the Crossland family. The Crossland coat of arms came to be associated with the Calvert family during their first forays into the American colonies, so it was a natural choice for people who wanted to represent their loyalty to Maryland while also proclaiming their Confederate sympathies. The two patterns were first used together in 1880 during a parade that marked the 150th anniversary of the founding of Baltimore. The flag did not have any official sanction from the state government at the time, but it became popular and was used at other ceremonies in the following years. The state government authorized it for use as a state flag in 1904. The flag is one of the most popular and distinctive state flags in America, so the design has never been changed.